Ronny has his PhD in street pharmacology. Reblogged this on Confessions of a Film/Video Editor. I’m a little in love with this! Relationship counseling is available in payroll. What’s the policy on dating in the office? They frown on candlelit dinners in the file room but we are allowed to hold hands in meetings. Omg that’s so funny. You have to be kidding me right? You should introduce bring your doctor to work day. I bet your boss would love that! Does your boss know he’s kind of daft? 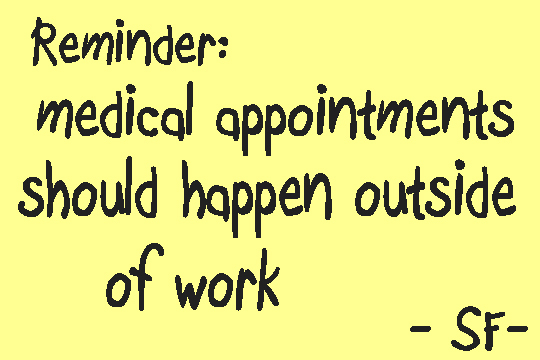 It’s a good thing you’re not a nurse with a hospital appointment, then! No more desk-side splenectomies. 😦 Coming soon… Picnic-side cholecystectomies! So long as you don’t perform a colonoscopy on the countertop of the communal kitchen, I think he’ll get over it ahahaha. Hi, I think your blog posts are HILARIOUS. I really look forward to reading more of your work… Fantastic. Don’t stop. I will look at your log if you like. Even though I ‘m not the person you asked. Ohh Myy Worrd, these are hilarious! I am in love with this blog! I used to be an office manager and I’m dying reading all of these! First time to your blog and I’ll probably be commenting often. I currently have a boss that likes to yell from his desk to us outside his office. Famous daily words, “Did you send me that e-mail? I don’t have it. I don’t see it. When did you send it? can you send it again?” All the time. I keep a folder specific to him of my sent e-mails- I use it so frequently. That’s nothing. My manager is a maniac. She calls people fat to their face! These crack me up, they really remind me of the daily grind.